Home > Law Books > Handbooks > Texas Rules of Evidence Handbook, 2019 ed. 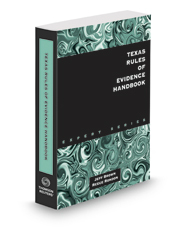 The Texas Rules of Evidence Handbook provides in-depth commentary and substantive analysis of the Texas Rules of Evidence for both civil and criminal cases. Written and edited by expert practitioners, the handbook explains the history, purpose, and effect of each rule. The commentary is backed by thousands of citations to rules, cases, and secondary sources.